I have been thinking about blogging for awhile now and with some recent encouragement from some very persuasive people in my life, I began considering it even more. It most certainly see the value in the platform of blogging. I religiously read a number of blogs, written by individuals I respect. Also, as an educator who regularly speaks to others about the collaborative value of social media, I figure I should really model this as a learner and practice what I preach in any format I can. Blogs can serve as an amazing curation of our work and our thinking, and a powerful opportunity as digital leaders. Online collaboration and networked intelligence is reshaping what it means to be an educator and learner in today’s world. If I am being completely transparent, what has held me back from blogging is a sense that, with all of the insightful, impactful educators out there, I really don’t have anything new to say. It’s not that I don’t have anything to say, just not necessarily anything original. But the more I kept thinking about it, the more I came to realize that for me, writing and blogging is not about the audience, but instead selfishly, about my own growth. Personally, writing has always served as a source of reflection, a place for working things through in my mind as well as documenting my journey. For two years I blogged about motherhood and life. That blog was a hugely rewarding endeavor. It had upwards of 400 readers a day, but in the end it was always an exercise of the heart and mind for me. I feel fortunate to now have all of those detailed anecdotes, experiences and reflections documented so thoroughly…. a true gift for myself, my children, and my family. As a brain tumour survivor writing also served as a place of comfort for me through some of the darkest times I can recall. It was an outlet for processing and for counting my blessings. And in more recent times and a very difficult diagnosis my daughter has endured, it is writing that once again called to me- to help me process, reflect and heal. I write regularly in my job and I put out a monthly publication around innovation in education, which has a very practical and informative feel to it. In my mind, a blog is more personal and subjective by nature. It is about putting our thoughts, opinions and feelings out there for the world to see. So in entertaining the idea of blogging once again, this one with an educational theme, my intention would be for it to be authentic and purposeful. Yet, a clear vision of what that exactly looked like remained unclear to me. Then, recently in reviewing a colleague’s notes from a session with creative educator and speaker Amy Burvall I came across a word, a concept really, that struck a chord. 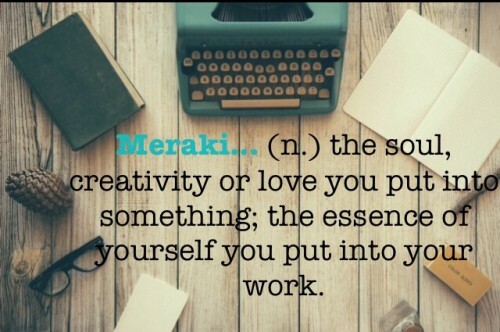 Meraki… “the soul, creativity, or love you put into something; the essence of yourself that is put into your work” (Greek origin). I instantly fell in love with this word and this notion- a word with no obvious synonyms, very little information online and seemingly not well known to others. How has this lovely, perfect word existed for so long, and I wasn’t aware of it? How could one word so completely capture so much of what I believe, value and aspire to? I am not sure what it is exactly about this word that makes me feel such a strong connection to it, but it is a kinship and affinity that I just can’t quite shake . And so from “meraki”…. a blog was born. A blog that will explore this powerful concept, and celebrate the wonder that comes from doing what drives us and what we enjoy most. To quote Amy Burvall, “As for Meraki, I think that perhaps it should be the goal for all of our work- as educators, as creators, and as students”. I tend to agree. We are surrounded by people who are blessed with talents, skills, strengths and things in their life that bring them joy. They are artists, musicians, designers, chefs, bakers, architects, coders, engineers, athletes etc. who are driven by creativity, and passion. I have never been an athlete or an artist, but as an educator, as a learner and as a leader I feel I have been lucky enough to find great fulfillment and pleasure in the work I do to support learning. Through that work I am blessed to live a “meraki filled life”. To put soul, creativity, love and the essence of yourself into your work…who could ask for more? If we take that one step further, is this not something we should aspire to for our students? More than ever in today’s dynamic world, our students need us to be their guide and their advocate. In a time when we are more informed with research and in many ways more in tuned to the needs of our students, we need to ensure we are offering them the opportunity to be creators and not only consumers of information. In a time when we have the tools and the opportunities to make learning more personalized, more engaging and more dynamic we need to make sure we are embracing these possibilities and making the most of them. It is through these means we can support our students in becoming autonomous learners, who discover their passions, and ultimately find their own sense of “meraki”. Next to the definition of meraki should be a picture of you. I think your blog will be well received and an extension of the passion you already demonstrate. It is an inspiration to read anything you write and my dilemma is how to make things happen for students and staff, more quickly…but maybe the soul, creativity and love is in the journey! thanks for sharing. What a great first post! The blogs that I most frequently read are not the ones with the ‘original’ content but the ones that I connect with… the ones that inspire. In order to do that a blog has to connect to the reading and draw them in. I felt that this post really did that. Well done Shauna! While we may speak every day, i very much look forward to reading more! Good start Shauna. I look forward to following you here. It strikes me that Meraki is exactly the opposite of the relationship most have with the products of the work they do in a commodified labour market. You don’t have to be a marxist to see the value of Marx’s concept of alienation. We are not the owners of or in control of the productions we try to put our heart and souls into. This lay at the heart of the debates in recent years about intellectual ownership in the world of academic production in the UK and beyond. I am a novice blogger myself, and I appreciate your description of your “why”. You aptly depict how it feels to share with an unknown audience. Keep up the great writing; I’ll be checking back in. Well done Shauna! I too am glad you defined the word “meraki”…never heard of that word before. It has been an interesting journey on my end as well…I am very thankful that you have been not only an inspirational piece of the larger puzzle but a trusted supporter of my goals. I have a couple people to thank for pushing me to where I am today, you are certainly one of them! Thank you!! Undoubtedly “Meraki” is a very appropriate name for your blog. From our first connection years ago, I noted that you had an educational passion that you shared with both students and teachers alike. I believe that you can always learn from others, be they student or teacher. Furthermore, what you take away doesn’t have to be an original “gem”. In all likelihood, the “nugget” will be a synthesis of ideas and practical classroom experience that you, too, will mold and refine. The important thing is that you share this idea, tip, or resource with others. https://www.flickr.com/photos/life-long-learners/15937713347/ will help you, as you continue to share both your original ideas and, perhaps more importantly, your reflections in your insightful “Meraki” blog.